The Kirkcaldy Herbal Clinic that operates from Health Food and More is Fife’s oldest herbal medicine practice. Established in 1997, over two decades of busy clinics has seen thousands of clients benefitting from herbal medicine treatments for a wide range of health problems. The founding Medical Herbalist, Keren Brynes MacLean owns Health Food and More and continues to practice two to three days per week alongside other NIMH registered practitioners. Medical Herbalists have exemplary medical training and it takes four years of studies, 500 clinical training hours and a thorough final clinical exam to graduate. This means your practitioner understands the complexity of medical conditions and can safely prescribe for you. People who choose to consult a Medical Herbalist often do so because they are feeling “stuck” and not getting better with conventional modern medicine. Doctors and orthodox drugs don’t always deliver results and sometimes you need to look at things a little differently. Medical Herbalists are good at joining up the dots, getting to the reasons why you may be unwell and then addressing health issues at the root cause and not just targeting symptoms. This whole body approach often means not only your presenting complaint gets better, but you as a whole person feel better. “I feel more like my old self” is one of the commonest statements people make after herbal treatment. 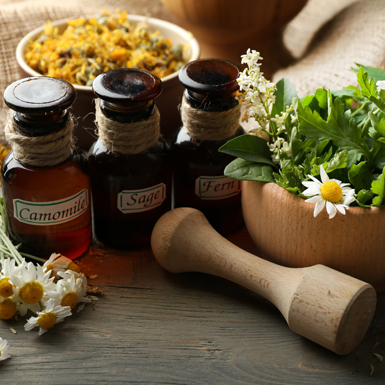 By correcting nutritional imbalance, encouraging positive lifestyle change, listening empathetically and blending your own unique herbal prescription Medical Herbalists are good at managing chronic grumbling problems that might not be getting better through any other means. Herbal medicine though gentle and restorative can also be very potent and concurrent medical conditions and medications need to be considered. The recommendation is that you seek consultation for any condition that would usually warrant a visit to a GP rather than buying over-the counter remedies. Find out more about training to become a Medical Herbalist and The National Institute of Medical Herbalists.